The Bayi Rockets won their first game of the season yesterday against Metta World Peace and the Sichuan Whales, 110-107. It was a victory coming against a developing Sichuan roster that has only been in the league for two seasons but even then, the Rockets needed some help from a legend. 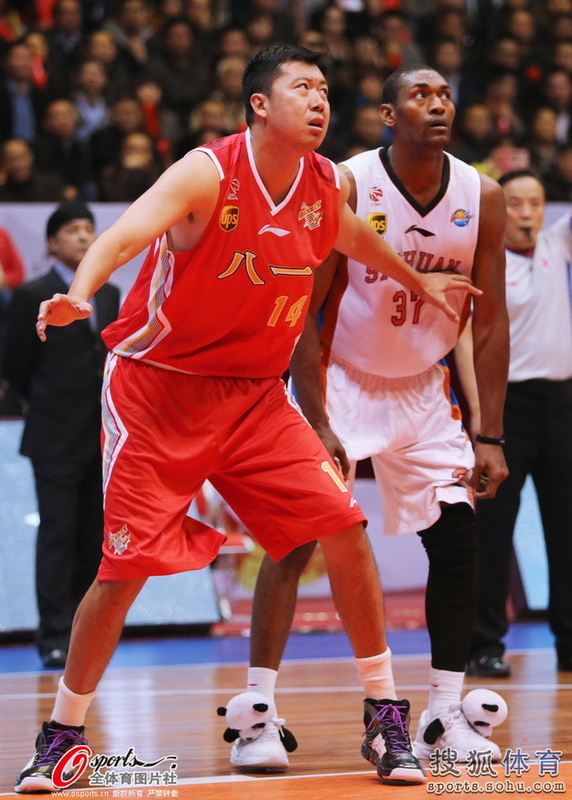 Having supposedly been retired, Wang Zhizhi made his season debut against the Whales, scoring 12 points whilst going 5-of-10 from the field. Thankfully for Rockets fans, the team has the all-important first win but some within Chinese basketball are asking if it was worth dragging one of their most beloved players on the court to do it. Wang, as has been discussed at length in the past on this blog, should have been retired. Instead he is not, and at thirty-seven years of age and with lengthy list of injuries, Bayi’s no.14 is still trudging up and down the court. Its unclear how much of this is down to Wang wanting to play and what Bayi expect him to to. The big man has talked about doing whatever it takes for his team but at this point, the Rockets need to do the responsible thing and not pressure one of their most famous players to keep on doing this in a rebuilding season. Purportedly Wang even had to go to hospital after the game due to what Sina Sports have called ‘cardiac discomfort’. This does not seem surprising considering that Wang did not train during the summer because he was not anticipating playing basketball anymore (Wang has admitted himself in previous interviews that he is not in playing shape). Wang is old and broken. He wants to retire. Instead, he is being obliged to play on for the team that raised him as a boy. Adiljan, the team’s head coach and Wang’s old roommate needs to end this. Zhang Jinsong, another Bayi legend from the dominant championship winning teams of the late 1990’s, is an assistant coach there too; he could speak up. But in truth, none of them will. All three are Bayi to their bones and could not think about saying no to a venerable sporting institution like the Rockets. Moreover, given the links Bayi have with the People’s Liberation Army and that its’ players are technically commissioned officers, Wang is essentially following orders to play on. ‘The King has returned!’ roared Sohu Sports in their headline, which is somewhat true. Wang showed some nice touches and despite his various ailments, the mid range shooting is still there as is the gentle touch around the rim. But it doesn’t have to be this way. Wang coming back will not mean Bayi stage a Hollywood-esqe run to the play-offs. At best, this Rockets team might go 8-26 if they are lucky- and the grand old man of Ningbo would probably have to play in all of those games for the team to win. China loves ‘Big Zhi’. I’ve watched journalists come down from the press box during warm ups and ask to have their photo talking with him. Its not hard to find fans on various local basketball forums arguing that Wang, not Yao Ming, is the best player in the country’s history. Despite the Bayi-Sichuan game taking place in the latter’s home court in Chengdu, the crowd were still chanting for the center to be put in the game and the loudest cheer of the game when he came off the bench in the first quarter. But China and Bayi also need to let the man go. Going into the game, the Rockets had lost twenty-one games in a row and Wang reportedly wanted to play to try and break the run. The question is will he play on Friday against Chongqing- an eminently winnable game, particularly now that Wang is back in the fold- but this is also a situation that suddenly doesn’t have a logical ending. ‘Let Big Zhi retire! His contributions have not been small; the solders [Bayi players] are athletes too!’ pleaded one internet commentator in the aftermath of the game. It is unclear if anyone is listening.